It's the latest swing in the fight over the state's recent 12-cent per gallon gas tax hike. Proposition 6 is on the November ballot to repeal the state's gas tax increase and new vehicle registration fees. The state raised the levies last year to generate billions of dollars in infrastructure projects. Dave McCulloch, communications director for Reform California, which sent out the mailer, says the Attorney General's ballot language does not make that clear. It instead reads that Prop 6 "eliminates certain road repair and transportation funding...repeals a 2017 transportation law's taxes and fees designated for road repairs and public transportation. The mailer instructs voters to keep it with their sample ballot mailed to them. Thad Kousser, a political scientist at UC San Diego, said ballot language is often contentions. But he noted the gas tax increase has been so heavily covered that most people will associate with Prop 6. He says this mailer reinforces that. 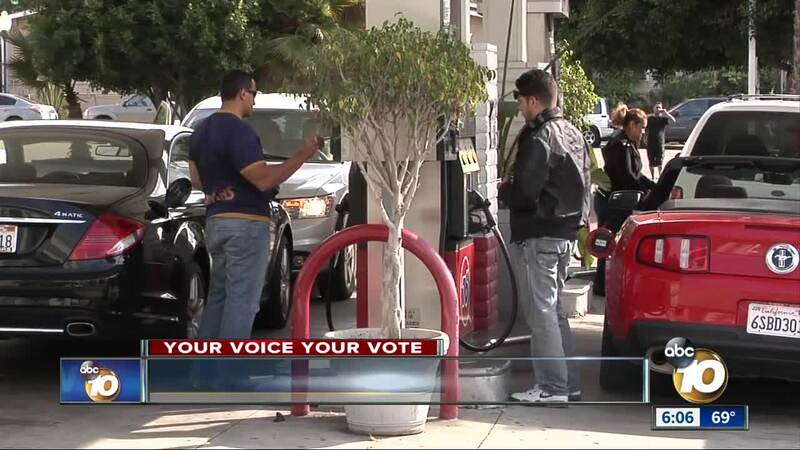 "When they get to their ballot on election day, they're not going to see repeal the gas tax," Kousser said. "They're going to see a proposal written legal language that says exactly what this bill does, which is it changes transportation fees and cuts funding for things." That mailer does include disclosures that it's not official and that Reform California paid for it. Still, Catherine hill, a local spokeswoman for the No on 6 campaign, called it deceptive. "It's made to look like a registrar of voters piece, so it's made to look official, so it's misleading," she said. The San Diego Association of Governments says more than 200 million dollars in funds from the tax increase have already been awarded to the region.